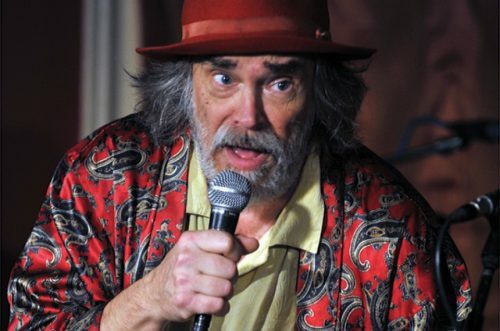 Chandler started as part of a comedy duo in the ’70s, launched a rock group in the ’80s, and has since released dozens of albums; he currently gigs regularly with three New England bands that he fronts, sprinkled with reunions of past units. We discuss “The Strongman of North America,” credited to his nine-piece band The Chandler Travis Philharmonic from Waving Kissyhead Vol. 2 & 1 (2017), “The Crutch of Music” by the Catbirds from Catbirds Say Yeah (2012), and “Fluffy” by the Travis Chandler Philharmonic featuring George Carlin from Llama Rhymes (2003). We conclude by listening to another Kissyhead track, “By the Way.” Opening/closing music: “Long As You Have Somebody Else” by The Incredible Casuals from That’s That (1987). For more information, see chandlertravis.com. Travis still plays the occasional show with his musical comedy duo with Steve shook. Here’s a horn-inflected number from their 1974 album. Travis’s ’80s band, The Incredible Casuals, also still plays; the other lead singer in that band is Johnny Spampinato, brother of NRBQ‘s Joey Spampinato. Read about Travis-lyricist David Greenberger’s “Duplex Planet” project where he records the everyday talk of old people as an art project (he even has a TEDx talk about it).